Blue chalcedony is a very attractive variety of silica. Its pleasing color has made it a most desirable gemstone among lapidaries, jewelry designers, and collectors around the world. Blue chalcedony is found in several places worldwide, with prime locations being Turkey, Namibia and Montana. It occurs in both crystalline and massive forms, such as nodules and smooth, rounded pebbles, massive boulders, druzy or botryoidal formations, nodules with druzy lining, or masses lining the inside surfaces of geodes. Even though blue chalcedony is mined in numerous places in the world, the quantity of rough material reaching the market is limited, which accounts for it reputation as a somewhat rare—or, at the very least, uncommon—gem material. Blue chalcedony nodules range in size and shape, and the colors vary from baby blue to bright blue to subdued tones of light blue. This nodule is from Turkey. 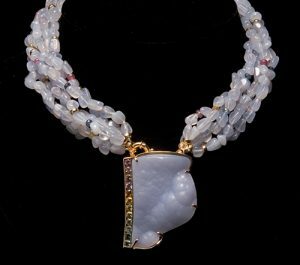 The name chalcedony (pronounced kal’ sed'nee) comes from the Latin word chalcedonius, which is derived from the Greek khalkedon. Chalcedony was found at the ancient Greek maritime town of Chalcedon (or Chalkedon), on the Bosporus straight in Asia Minor (modern-day Turkey). The contemporary town is named Kad'köy and belongs to the Istanbul district. Both chalcedony and quartz have the chemical formula SiO2; the difference between the two is in their crystal structure. Crystalline (sometimes called macrocrystalline) quartz typically forms crystals that are large enough to be visible to the naked eye. Its varieties include rock crystal, amethyst, rose quartz, and smoky quartz. Crystals form in the trigonal system and can be terminated, doubly terminated, or twinned. It rates a 7 on the Mohs Scale of Hardness. Quartz has been one of the most popular gem materials utilized by carvers and lapidaries since antiquity. Its hardness, wide range of textures and color varieties, crystal sizes, durability, availability, and relative affordability make this group of gemstones most attractive to carvers. Chalcedony is a cryptocrystalline, or microcrystalline, variety of quartz; its crystals are too small to be distinguished without magnification. While chalcedony may be slightly softer than quartz (Mohs 6.5-7), the compact, dense arrangement of its crystal structure gives chalcedony greater strength. It is hard enough to be used for intricate carvings, takes a high polish, and exhibits good wearability, making it suitable for jewelry pieces. Some chalcedonies are better known by their variety names, such as chrysoprase or carnelian, some by their color prefix, such as pink chalcedony, and others by a mine name or location, such as Holley blue chalcedony. In the jewelry trade, however, the term mainly refers to the white, gray or blue, translucent type. Patterns are not as common in this material as in multicolor, banded agates and jaspers. It may show hue and tone variations within the primary color, or some color banding, but it is best known and valued among carvers and lapidaries for their color uniformity and lack of undesirable inclusions. The chalcedony gems with the most allure—and, consequently, the higher prices—are the ones with the brighter and more intense colors. On the other hand, the pale colors referred to as “pastels” have their own attraction and charm, and have been successfully marketed. Blue chalcedony definitely falls under this banner. While most chalcedony varieties are translucent to semi-translucent, some very fine material may reach the semitransparent level. 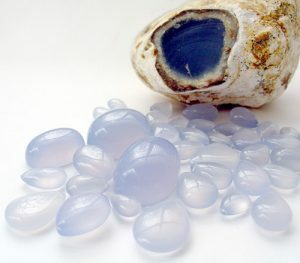 The term “blue chalcedony” is often interchanged with “blue agate” or “blue chalcedony agate” on the market; although they are similar materials, they are somewhat different in appearance. Blue agate, especially blue lace agate, shows more pronounced white and clear banding, whereas the blue chalcedony may exhibit only faint white banding. It is not always clear which material is which, and it is very difficult to identify the source if a piece is not already labeled. Chalcedony is one of the most ancient gemstones; it was carved into cylindrical seals in Mesopotamia as early as the 7th century BCE. 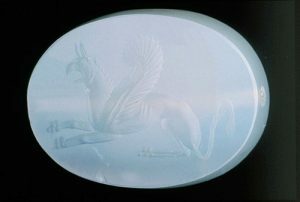 Over the centuries, blue chalcedony has been used for cameo and intaglio carvings, as well as sculptural carvings. designated as such by Governor Tiemann in honor of the state’s Centennial. On the Web site of the Secretary of State, it is also referred to as “blue agate”. 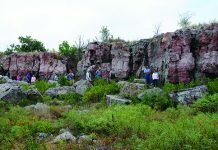 “The blue agate,” according to the site, “can be found in northwestern Nebraska, where it formed in wind-blown silt and claystone” (www.sos.ne.gov/symbols/gem.html). Renée Newman in her book "Exotic Gems, Vol. 3" (international Jewelry Publications, 2014) devotes an entire chapter to this beautiful material, with a multitude of photos of designer jewelry, beads, cabochons and rough, including two of my pieces. 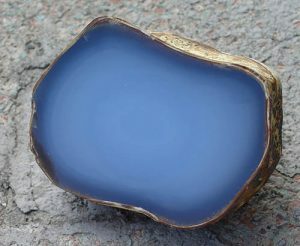 Although glass and plastic imitations of blue chalcedony occasionally appear on the market, as well as material stabilized with epoxy resins or Opticon® (a two-part fracture sealer), Newman states that “the biggest identification challenge is determining whether blue chalcedony is untreated or not”, as it can be dyed in order to achieve a deeper color. She recommends that buyers “look under magnification for color concentration, and for a pink or red reaction under a Chelsea color filter”. It is best to buy from trusted sources. Blue chalcedony occurs in a range of blue hues, from pale to darker blue, some with tints of gray and some with tints of pink. The color is generally attributed to the interference of light caused by voids between the individual crystals, a phenomenon known as “scattering” (www.glypticconcepts.com/AboutBC.html). The names under which blue chalcedony appears on the market often reflect its location or source name, or describe the type of formation in which it occurred. Blue chalcedony nodules range in size and shape. The rough material lends itself relatively easy to small carvings. The shades vary from baby blue to bright blue to subdued tones of light blue. Very high-grade blue chalcedony nodules are found near Eski'ehir, in West Anatolia, Turkey, about 200 miles southeast of Istanbul. Almost all nodules come with a whitish-yellow rind. Some of the material is a beautiful, deep, saturated shade of blue, while others are somewhat pastel in color, and some display beautiful dendrites (http://chalcedonymine.com/). Nodules of exceptional blue chalcedony also come from Namibia, Africa. This material is often referred to as “African Blue”. The uniform color is usually a deep blue without any banding, but may also range to grayish blue. “Glory blue chalcedony”, also called “Montana Glory Blue”, from Beaverhead County, Montana, is a beautiful blue chalcedony that has often penetrated sand-colored rhyolite. The combination of stones may be used to create interesting patterns in carvings. The chalcedony found in neighboring Madison County, along the Madison River, is referred to as “Madison Blue agate”. “Mohave Blue” is a grayish- or violet-blue variety found in California that may exhibit adularescence, and therefore resemble moonstone. Another variety is “Mt. Airy”, a grayish-blue shade of chalcedony from Nevada. Beautiful blue to lavender nodules of blue chalcedony come also from Sumatra and West Java, in Indonesia. Some attractive and rare blue chalcedony nodules come from Ellensburg, in central Washington. The material is often referred to as “Ellensburg Blue agate”. 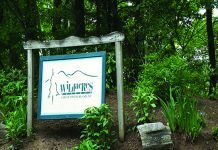 It is all found on private property. A collection is housed at the Kittitas County Historical Society and Museum, located downtown. Ellensburg Blue chalcedony ranges from light sky blue to cornflower blue (http://blueagates.com/id1.html). Blue Lace agate ranges from light to medium blue, and exhibits pronounced bands with intricate, lacey, white patterns. It is only found in the Kalahari Desert in Namibia. Fine druzy blue chalcedony from Turkey and Malawi is a light-blue material that occurs mostly as thin, flat crusts, with very fine mineral crystallization. It has usually been cleaned somewhat at the mine or by the dealer. The allure of the druzy materials is in two major features: the preservation of the natural mineral surface, which appeals to a wide variety of customers, and the ease of carving, as the carver has often only to deal with the girdle and bottom surfaces. Usually, the bottom layer of the druse has a very finely pitted surface that can be left untouched, while at other times it may be uneven and in need of sanding. Sometimes, the druzy surface is on both sides of the material, and the decision of which side to use as the top of the carving rests with the lapidary. Botryoidal blue chalcedony is similar to fine druzy chalcedony, as it also occurs in crusts. Instead of tiny crystals, the surface is smooth and glossy, with a botryoidal (grapelike), or bubbly, appearance. Sometimes, small angular crystal formations appear on top of the “bubbles” or blobs. Botryoidal blue chalcedony comes from Turkey, as well as from Malawi in Africa, and Sumatra, Indonesia, and Washington state. Gem artist Will Johnson, of Premier Gem Design and Glyptic Concepts, has masterfully cut all types of blue chalcedony. 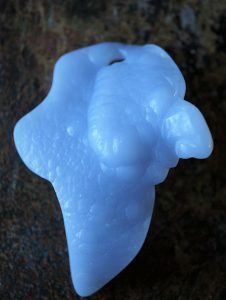 He describes an unusual internal billowing effect in botryoidal blue chalcedony as the “turtle-back” effect: a bumpy interior that is magnified when the stone is cut and polished (www.glypticconcepts.com/turtleback.html). Velvet druzy blue chalcedony from Turkey is similar to the fine druzy, but is a rather rare variety. The surface has a velvety-looking texture as the crystals are oriented at a small angle, and exhibits a strong shimmering effect. Chrysocolla in quartz, also known as gem chrysocolla and chrysocolla in chalcedony, is, as the name suggests, quartz or chalcedony that has been penetrated by veins of the bright blue-green copper mineral chrysocolla, giving it a similar appearance to turquoise. The best variety is known in the trade as “gem silica”, which is solid, hard, compact, and highly translucent. Completely saturated with chrysocolla, it displays a bright, electric-blue color, and sometimes has small, very fine druzy pockets that sparkle and make stunning carvings and free-form cabs. Chrysocolla in quartz may be scattered with malachite “confetti” inclusions or stunning, strawlike formations, or plumes of sagenite inclusions. 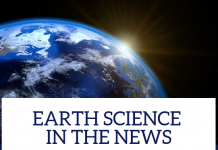 True gem silica from the Inspiration mine or the Ray mine, near Globe, Arizona, has reached legendary status. It is very rare and very expensive. Although chrysocolla in quartz is a type of “blue” chalcedony, the term “blue chalcedony” is only applied to the solid-colored material described earlier. 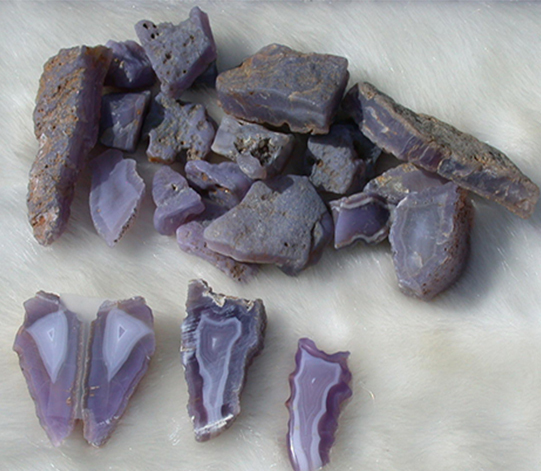 Similar to the blue chalcedonies are the purplish-blue varieties. Holley blue chalcedony (also spelled Holly) from western Oregon is found near Holley, just four miles southwest of the town of Sweet Home (Linn County), near the Calapooia River. The color ranges from a deep blue to a lavender blue. Holley blue chalcedony may also have fine, lacey, white bands and fortification patterns. Due to the banding, the material is also known as Holley Blue agate. This material is held in very high esteem by carvers for its distinct color and uniformity. Sometimes, it comes with an outer layer of rhyolite. to deep purple, and are highly translucent, with a “misty” or “foggy” look. Some comes in nodules (California, South Dakota), some as limb casts (Nevada and Oregon), which are chalcedonic replacements of wood, and some with beautiful, delicate, black dendritic patterns. 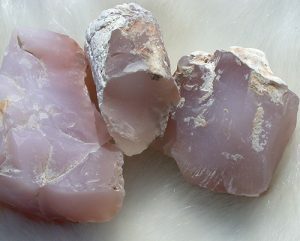 Plum chalcedony is a grayish-violet-purple, semitranslucent variety from Nevada. Botryoidal purple chalcedony has a lavender shade and stunning botryoidal formations. It is also known as “Grape agate”. The “bubbles” are usually smaller in diameter than in the blue chalcedony, but they are very three-dimensional. The crust on rough material is somewhat thicker, and some extra grinding may be required on the bottom of the carvings. Several varieties come from Indonesia, Utah and Arizona. Sometimes, it can be confused with lavender botryoidal smithsonite, which is much softer (Mohs 4-5). Amethyst Sage chalcedony, from northern Nevada, is a translucent lavender chalcedony with black and brown, dendtritic inclusions of manganese. The scenic material, known as Amethyst Sage agate, ranges from opaque or semitranslucent to the purer, translucent purple chalcedony, occasionally with the delicate black dendrites. Damsonite, or Burro Creek chalcedony, is a grayish-violet variety from Arizona. It is opaque and fine-grained, often with some dendrites and white flakes. Blue chalcedony, with its glowing, translucent tones, is a very popular gem material for carving and cabbing, and for beads. Carved gemstones in blue chalcedony, high-domed cabochons cut for deeper color saturation, and beads of all shapes and sizes, are in high demand, and are often found on many jewelry designers’ palettes, sketchpads, and wish lists. Their pleasant, often subdued appearance holds its own beauty and charm. Stunning design combinations can be achieved with blue chalcedony that displays whitish patches or dendrites and by including part of the outside rind. Carvers and lapidaries take advantage of the varying surface textures—smooth and druzy—and create beautiful combinations in cabochons and carvings. They also look for clean, gellike, uniform material that will create pristine carvings. 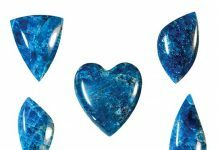 Druzy blue chalcedony is rather easy to work with, whether cutting freeform cabs following the natural outline or cutting it in symmetrical or geometrical shapes. The druzy layer is often on top of hard, blue chalcedony, which can be smoothed and polished to create wonderful contrasting textures. I occasionally line-engrave the fine druzy, running lines or grooves across the top surface. These lines give dimension and an organic feeling to the carving, a trademark technique that I have also used on other druzy materials. 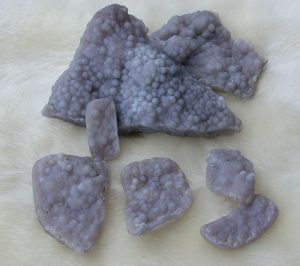 Compared to the low profile of fine druzy material, the high domes or peaks of botryoidal chalcedony may make it a bit more challenging to cut and set; on the other hand, they make the carvings most unique and attractive. In all types of chalcedony, there is a certain amount of heat sensitivity during carving, shaping and polishing, but there is little to no cleavage trouble. However, fracturing or chipping may be a problem. Natural fractures are common, and it is best to either work around them from the start or to saw the material right down the fracture line; otherwise they will be revealed later with transmitted light in the finished gem. Follow the standard carving and cabbing procedures for most other chalcedonies when working with blue chalcedony. If the material is rather thin, avoid coarse grinding with wheels below 120 grit. Although the chalcedonies display a waxy or dull luster, as opposed to the vitreous luster of their crystalline quartz counterparts, they easily achieve a very high polish, either with diamond grit or with polishing compounds such as cerium oxide or Linde A. All druzy surfaces require meticulous cleaning. Fine dust often remains in the pits even after vigorous brushing with a toothbrush, and reappears as a cloudy, white layer when the stones are dry. Stones should be ultrasonically cleaned or steamed clean. The surface of the botryoidal stones is much easier to clean. Some lapidaries will tumble-polish their finished cabs. Another problem blue chalcedony may encounter is fading in the sunlight. Many lapidaries keep the rough material for a long time before cutting in order to make sure that the material has not faded. It is always a good practice to keep such material away from direct sunlight exposure and bright lights in the showcase. When cut into cabs, some very fine blue chalcedony may display the phenomenon of adularescence, a shimmering or glowing optical phenomenon that may enhance their overall value. The gentle and muted tones of blue chalcedony gemstones offer a great palette to start designing around. They are often combined with orange or yellow stones, which make the perfect complementary color match. I have found that blue chalcedony combines wonderfully with pink gemstones, such as pink tourmaline and pink sapphire. The subdued tones of blue chalcedony were chosen as one of its 2016 Colors of the Year by the Pantone Color Institute™, which named the shade “Serenity”. A blend of “Serenity” with “Rose Quartz” was said, by the Pantone experts, to “demonstrate an inherent balance between a warmer embracing rose tone and the cooler tranquil blue” (www.pantone.com/color-of-the-year-2016). One thing I love reading on Pantone’s Web site is the sophisticated names of the chosen colors, along with their concise, but elaborate, descriptions. The color names exude a luxury feeling and an exotic sentiment. Designers can find inspiration for new jewelry concepts within those few words. Pantone’s seasonal color picks always offer a wide array of shades, with subtle hues and tones that differ every season, allowing designers to identify with at least one of them. I often make use of the Pantone color schemes to group together gem materials for a season or to promote a particular gem material, especially one that customers may not be familiar with, such as lavender jade, Sugarcane emeralds from Brazil, or blue chalcedony. I also get inspired to combine pendants and bead strands by combining the season’s colors, giving a new, fresh look to my designs. 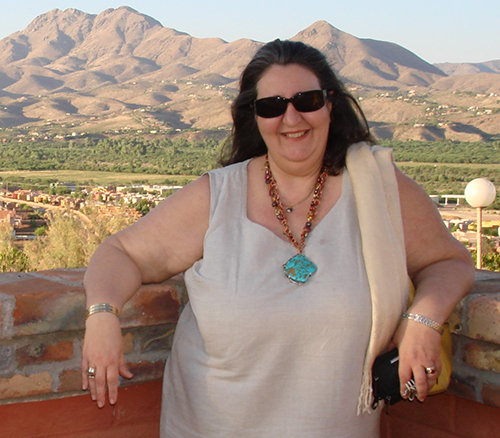 A 2003 National Lapidary Hall of Fame inductee, she is an acclaimed gem sculptor and gemologist with over 35 years of experience in unique gem sculpture and jewelry art. She can be reached via her website: www.gemartcenter.com and her business Facebook page at Gem Art Center/Helen Serras-Herman.